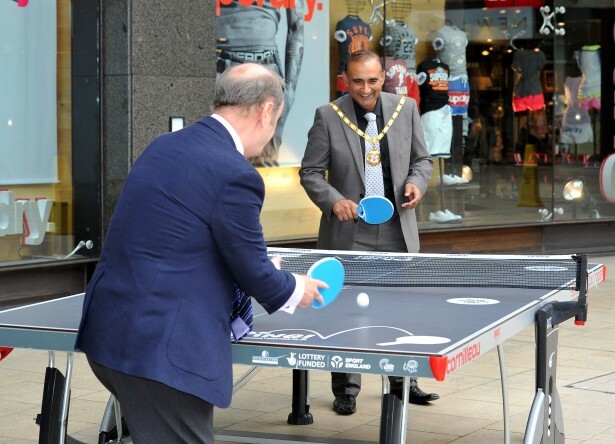 intu Milton Keynes invited the new Mayor of Milton Keynes, Subhan Shafiq, to play a round of table tennis with Martin Hindson, General Manager of intu Milton Keynes. The two gentlemen enjoyed a game of table tennis which both said ‘took them back to their college years’. The Shopping Centre is playing host to the ping pong table as part of Ping! Milton Keynes, an initiative produced by Milton Keynes Council Sports Development Team, in partnership with Table Tennis England, Make a Difference and Sing London. The Ping! MK table is in Oak Court until the end of August, it has been in place since the beginning of the summer holidays and is free for everyone to enjoy. Bats and balls are placed at the sides of the table for people to join in the fun any time. Milton Keynes is one of 16 regions that have been selected to be part of Ping! this year, along with Oxford, Birmingham, Liverpool and London, to name a few.